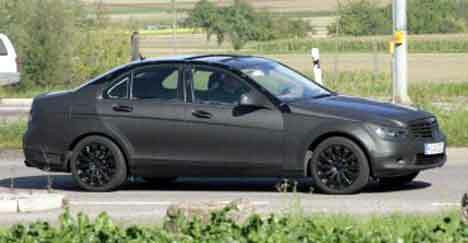 An almost undisguised C-Class has been spotted out during testing. DaimlerChrysler will be releasing their next generation Mercedes C-Class at the Geneva Motor Show next year. The matching estate version will follow about half a year later Autumn 2007. Altogether it will be a completely new model range offering standard RWD and AWD as an option. Power will come from a variety of four and newly developed six-cylinder engines. We can expect a sporty AMG version too.